HARLINGEN — Fred Rendon dodged machine gun bullets as he guided his lieutenant at night to another Marine camp north of Da Nang during the Vietnam War. He still remembers the bullets zipping past his head and body like flying red and green streaks through the air. After transporting the officer to his destination, the 18-year-old was assigned to night watch in a bunker where another Marine had already lost his life. While under the cover of night, and still rattled from the enemy gunfire, Rendon did what he had to do to stay alive. He removed the dead soldier from the bunker and kept watch. Shortly after, he saw the enemy approaching. He loaded the .50 caliber- machine gun and started to fire the weapon across the field. 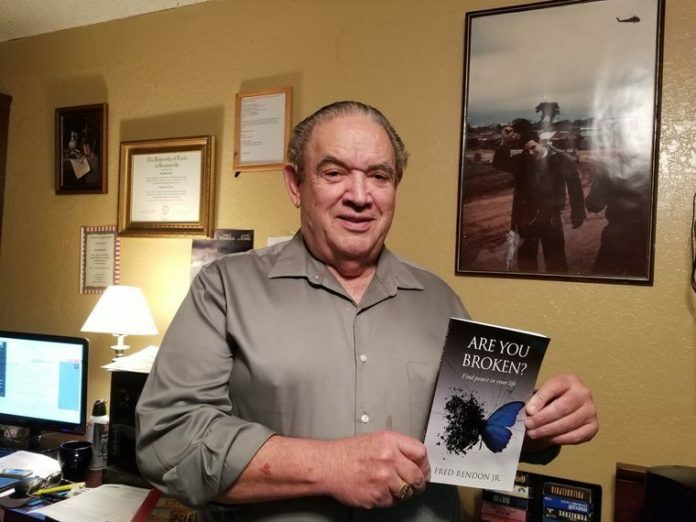 This is just one of the life experiences Rendon, now 71, describes in his book “Are You Broken?,” which he says can help war veterans beat Post-Traumatic Stress Disorder and obtain the VA services they need. Rendon is scheduled to have a book signing in McAllen at the Barnes and Noble located off Ware Road from 3 to 5 p.m. Saturday. There he will be talking about his book, signing autographs and accepting donations to a nonprofit organization to help veterans. Rendon left the Vietnam War with loss of hearing and damaged knees. Rendon was with the 1st Marines Division 7th Engineering Battalion from 1965 to 1969. Little did he know after joining the Marine Corps at 18 he was going to leave the war and have to fight off PTSD. He had joined the Marines for the challenge and to get stronger. After helping more than 100 veterans find benefits with the VA, Rendon says his book will help more people struggling with PTSD. He has led a fight with the Veterans Affairs hospital system most of his adult life. It all started when he says he was denied assistance for his loss of hearing. “They are bad,” he said about the VA. He said after the war he struggled for 10 years with anxiety attacks, loss of hearing and his bad knees. He even struggled to hold a job. He said he had anxiety, depression, was an alcoholic and had thoughts of suicide.